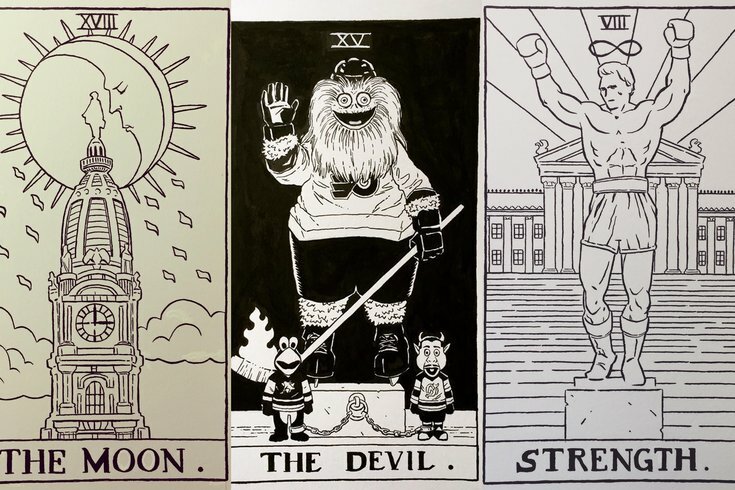 Philly's characters and icons make a perfect cast for a tarot card deck. Philadelphia illustrator James Boyle admits he didn't know much about tarot cards when he was commissioned to create an illustration for a Philadelphia magazine story about the city's interest in fortune-telling and astrology. It was just seen as a good visual. But when the story was released, and he started noticing people talking about his cards, which featured the Phillie Phanatic, City Hall at night and the Rocky statue, he realized there might be something more to the project. "There was overwhelming positive feedback and interest," Boyle told PhillyVoice, "and almost this demand to see more cards or even a complete deck. So I decided I should seize the opportunity and make that a reality." He saw people all over Twitter, Instagram and other parts of social media sharing it with friends and tagging each other, so on Oct. 2 he put out a blast on his professional Facebook page saying he was going to create a full 78-card deck. After he did his homework, of course. "After the article came out and I decided to pursue the project," Boyle said, "I contacted a good friend of mine who does tarot readings. I went and visited her, and she took out a few of her tarot decks, because she has different ones. She explained to me how it all works, and gave me my first tarot reading. I went home with all that, and I was ready to start." People started sending suggestions via Facebook almost immediately: Temperance holding a Citywide special, cheesesteaks as the Ace of Wands, even Rob McElhenney as The Star. They weren't all hits, though. "Someone requested to see Philly Jesus on a card," Boyle said, chuckling. "I don’t think that would work, because I feel like putting Philly Jesus on a tarot card would just get confused with putting regular Jesus on the card." For those interested in following the project's progress, Boyle will post his illustrations on Instagram, @boylejames, and his Facebook page, James Boyle Illustrations. The official hashtag for the project is #phillytarotdeck. It's going to be a grind, but it'll be worth it. "I know I can't please everybody," Boyle said, "but it seems like people are having fun coming up with their own ideas."